Solution to change drive letter name in windows 10, this is also for 8.1 and Server 2016! This sleek solution for changing the drive label is not only suitable for the latest Microsoft Windows operating system, it can also be used on Windows Server 2016 and 2012. Some renaming actions may require administrative rights or permission to rename drives! 1.) ... Fast renaming of the drives via the file Explorer! 2.) ... Renaming from Windows Disk Management! 3.) ... What should I consider when renaming the drives under Windows? See also ► recovery drive for Windows! 1.) Fast renaming of the drives via the file Explorer! Please start The MS-Explorer, for Example via Windows-Logo + E keyboard shortcut. Please select the Drive / Partition. Via right click open the Context Menu and select Rename. To personalize the Windows computer in this case change the volume name of the HDD in this example is the default name system, use your personal and individual name for the partition, the windows 10 can works whiteout problems if you change the label name. (Image-1) Rename Partition eg Drive on Windows 10! 2.) Renaming from Windows Disk Management! For this second solution please start the disk management tool in Windows, the fastest way with keyboard shortcut [Windows + X] and the option "Disk Management"! In disk management, select the drive (volume) on which the drive letter you want to modify. (Image-2) Change drive letter name in windows! 3.) What should I consider when renaming the drives under Windows? If several operating systems are on the same computer, for example Microsoft Windows, Linux, Apple's Mac OS, goggles Android This changes will be valid for all operating systems! If you have drive paths for example from E: to F: Change and on which software and program are installed, the corresponding software can no longer function properly aussee it's portable applications! See also: ► ► Show hidden files and folders in Windows 10! 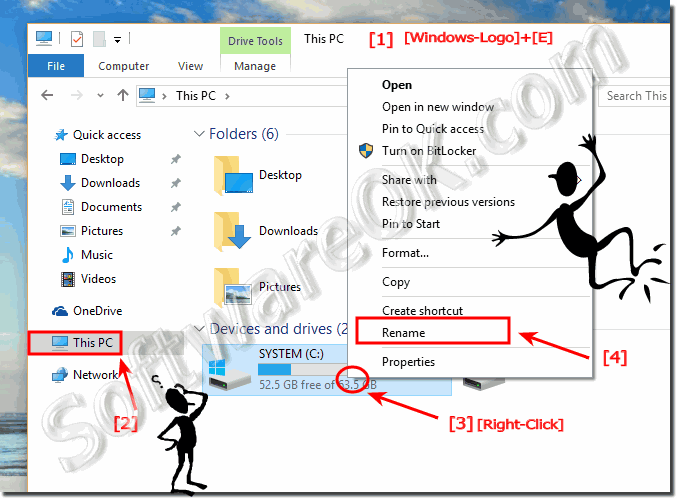 Windows-10 - FAQ-118: Can I change drive letter name in windows 10, how to?